On the left side of the module you find the Navigator, Presets, Snapshots, History, and Collections panels. On the right side you find the processing tools, Histogram, Tool strip, Basic (editing tools), Tone Curve, HSL/Color/B&W, Split Toning, Detail, Lens Correction, Effects, and Camera Calibration panels. I will provide information on some of the panels, but not all of them and will post additional information on specific panels at various times. In this module you process the photos, crop them if need be, add a vignett, sharpen, alter color, you can work on enhancing a sky, changing the tone of a photo, and correcting color calibration issues. Let's assume you imported your photos into LR and they are ordered in the way you want them. You’ve gone into the Library module and tossed some photos and kept others: you’ve checked using 1:1 in the Navigator panel to be sure the photos you are keeping have sharp focus, and now you want to start the processing process. What I Do: I’m going to share with you how I approach processing photos in LR, others may do it differently: what I do can serve as a guideline. Remember, while there may be a “right” way and a “wrong” way, in some instances processing is often about getting to the vision of the photographer. Yes, there can be obvious flaws in editing, as in sharpening way too much or “pushing” the file so far the edges start to glow! In general, however, using “safe and sane” editing/processing techniques there is a wide range of “right.” You may like that highly over-saturated look while I do not particularly care for it: so, you do what you want with your photos and I’ll do what I want with mine and we’ll tell everyone to let us do “our thing” in art and leave us alone! Art is about interpretation and artistic license; it’s about having a vision of what you want and figuring out how to achieve that vision. Ansel Adams knew this well and took every artistic license he could in his day to get his photographs processed to fit his vision. You find the module names across the top of each panel. I use the panels in “solo mode,” so that means only one panel is open at a time. Right click on any panel name and a screen will pop up that gives you the option to click Solo. However, if you want to have them all open at the same time, that’s fine, too. The first thing I do, if I believe it is needed, is set a Camera Calibration, which is the panel at the bottom right of the Develop Module. In Camera Calibration you find the “Process” version, Adobe’s way of saying what edition of software you are in or were in with another photo if it was shot prior to the current version. I am assuming with this discussion that you have clicked on a current photo and it is showing in the middle screen so the Process version should read 2012 (Current). Leave it as is. The next line of text down says “Profile.” If you shot in RAW you can change this profile to match that of your camera by clicking on the text and choosing a standard. Play around with these as they very from camera-to-camera. If you shot in JPEG this choice has already been made for you and you cannot change it. The sliders below that text, Shadows, then Red Primary, Green Primary, Blue Primary, allow you to correct a color tint. For example, my Nikon D800 shoots very “hot” in yellow at times: I can move the Green Primary slider more toward the green side, either hue or saturation, and make an attempt to correct that color cast. You do this individually for each photo. These changes only apply to the photo you are working with and the sliders always start at "0." Most times these days I use the original camera calibration as set when I took the photo since Nikon updates seem to have improved it. I generally always put a tone curve on the photo and I do this early in the process of editing. In the tone curve panel you will a text box that says “Point Curve: Linear, click on that and you have two other choices to choose from. There are other ways to create a tone curve but I will not talk about that at this time. Speaking of basics, that is generally the panel I go to next. If you like the White Balance you set in the camera you are good to go. If you shot in JPEG the White Balance was set somewhat in stone in the camera, but not entirely. If you shot in RAW you have a lot more leeway to change the WB. In the Basics Panel at the top you will see the letters WB, for White Balance. If you click on the up/down arrows to the right, it generally says "As Shot" next to the arrows, you will see several choices for a RAW photo, play around with them to see how it changes your photo. You can also use the Temp or Tint slider, which is the only way to change the WB on a JPEG. Using the Temp slider you can add or subtract warmth as you see fit. In general, daylight is around 5500. You can use this as a guide when changing WB. Auto, clicked on, will automatically process your photo to some degree. It will not use the Presence panel sliders nor will it sharpen your photo, set a tone curve or a camera calibration. It can provide you with a quick start on a photo and also let you see a darker photo at a brighter exposure just to see if you like the photo. You will still need to process the photo before it can be called a completely processed and finished photo. In this panel I increase exposure for brightness, pull down Highlights to darken a sky (dragging a slider to the left is a minus and to the right is a plus) , pull up Shadows to lighten a dark part of the photo, pull Whites up and Blacks down to provide an overall adjustment or deeper overall color. I will set a black and white point in one of two ways: one, by simply watching what the histogram at the top right does, watching that the "hill" spreads out to both sides but does not touch, or by clicking on the Whites teardrop on the slider and at the same time holding down the Option/Alt key—the entire photo will turn black and as you slide the Whites slider toward the right you will start to see colors. When you see a color come up, stop and slightly push the slider back to the left just a tad. Do the same thing with the Black slider but push it to the left instead and then just a tad to the right. I usually put a little clarity on my photos as I like the look, maybe 10 to 20 points: don't add Clarity if you want a softer look and it's best not to add clarity to people's faces. If you are working in a high contrast photo it sometimes helps to pull the Contrast down to even out the photo. In some photos, however, I add contrast because I like how the photo looks with more contrast. I like to add a little Vibrance, about 10 points, and do not usually add Saturation. Adding Vibrance adds richer color to the part of your photo that needs it, adding Saturation adds richer color to the entire photo. As I work I click the "F" key so that I can see full screen what the photo actually looks like when it's enlarged (hit "F" again to back to the standard view). 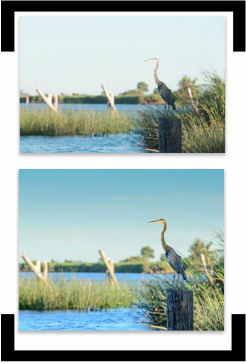 At times, I use the "Y" key so that I can compare what the photo looked like initially and what it looks like after processing (hit "Y" again to go back to normal view). Sometimes I need to lighten up the photo using Exposure, but be careful when doing this as it will also lighten up your sky or anything that may be tending toward too light, too, which you normally do not want. Work with the other specific sliders to see their effect first unless the photo is very dark and you must lighten it up right away. Look at the histogram at the top right and check to see if the histogram is spread from the left side edge to the right side edge, but not touching either side: this is a good general rule for getting exposure correct. Spotting removed the telephone pole and lines. Spots on a photo happen when your lens or sensor is dirty. They show up as small blobs, especially in a blue sky. To check your photo for spots, hit the shortcut key "Q." This key opens up a tool on the Tool strip, called the spot remover, and allows you to remove dust and spots and small annoying objects that might detract the viewer's eye from the main subject. If you see a spot on the photo simply click on it and you will see a circle appear (called a white marquee) and the spot disappear (in most cases). Working with the spot remover takes patience and some practice at times. If a spot does not clean up right away, then drag over it again from a different direction. You can also pick up the circle, by clicking and dragging, that you see and reposition it to cover more correctly or to use another area of the photo. From Apple: "Heal Matches the texture, lighting, and shading of the sampled area to the selected area. Clone Duplicates the sampled area of the image to the selected area." I generally use Heal. For larger and more detailed corrections of this type I often use Photoshop, moving to Photoshop directly from LR and working on a copy of the file with the LR edits intact: the photo is automatically saved back into LR. Click on Visualize Spots at the bottom left, under the photo, and your photo turns black and white and all your dust spots show up, especially in the sky. 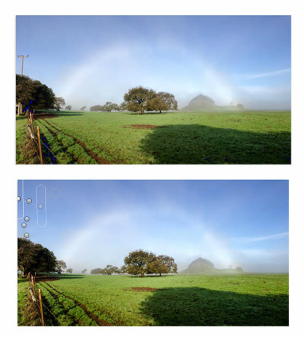 Use the tool in the same way, clicking on the white blobs in the sky and others areas of your photo. Move the slider to get a different black or white view as you edit. Unclick the box to go back to the normal "Q" view and click on another panel or tool to leave the spot tool. You can also drag the tool over an object to remove it. A spot can also be something that is just distracting, perhaps a small rock that juts partway into the edge of your photo, an airplane trail or a utility line of some sort; maybe even a tree branch jutting out or even tree foliage with too many holes in it. In the Lens Correction panel under Basic click on the Enable Profile Corrections if the photo appears to need that (trees or buildings leaning in precariously or something looking like it bulges when it should not) and Remove Chromatic Aberration (a not so good purple fringe around photos that I don’t think anyone ever wants to keep but that often shows up if you shoot in very low light!). You can try the Level button to level a photo but sometimes that does not work and it’s easier to level in the Crop panel, which you can get to very quickly by hitting the "R" shortcut key. At this point, using the Detail panel you can sharpen the photo and you should have a decent first-pass processed photo. Granted, many photos need a lot more to realize their full potential but it takes time to learn all this. In the Detail panel under Sharpening push the Amount slider to around 50 or so and the Detail slider to about 70, leaving the radius at around 1.0. A tip on the sky in a landscape photo: a sky does not need sharpening so click on the Masking teardrop and hold down the Option/Alt key and the photo will turn white. Push the Masking slider to the right and as you do this the photo will turn black and white. The white means that portion of the photo is going to have sharpening applied, the black means that portion of the photo will have no sharpening applied. Note that once you pushed the slider to the right the sky turned black, thus no sharpening (and thus less grain) will be applied. Move the slider around until you get it balanced where you want it in the photo. Note that you do not need to hit Save as you do in other programs, the program saves everything automatically. Whatever edits you have made are automatically saved in a file separate from the original photo. LR saves only the changes you made and does not alter your original photo. However, note that you should routinely make a back up copy of the saved edits in LR and when you close the program it will ask you about that, say Yes! Your original files stay just that—original—in whatever place you store them and LR keeps its own file of the changes in another location (like icing on cake but the cake and the icing are stored in two different refrigerators and put together when you need to use them). The edits are actually applied to the photos when you export them. There is, however, the option to Save if you need to because you want to work in a program from within LR that requires you to save the edits (for example, Bridge) to work in that particular program. There are many, many other things to learn about this program but now you have at least started to learn how to process a photo in LR.